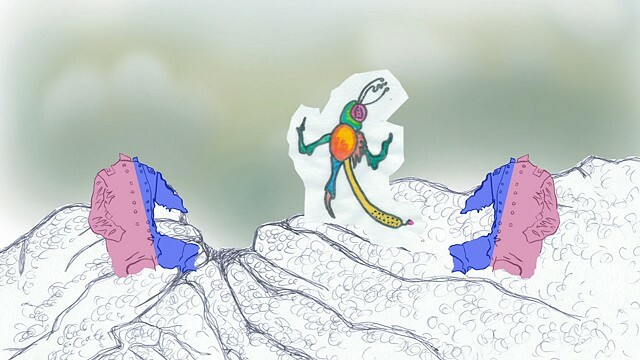 A very Queer animation, in every sense of the word, 'Spineless Deities' takes place in a multi-, yet two-dimensional Dimension: a dreamscape on a nightmarish edge. The experimental format provides a unique take on the theme of the Universal Soldier, on the love and desire expressed by an ‘Elder Soldier In The Brotherhood to The Younger' (TOWARDS DEMOCRACY, Edward Carpenter,1892). Stripped down, their jackets silhouetted in two-toned blue and pink, are the soldier protagonists, suspended in a memory of lost love encapsulated forever in this static, strobe-like world. The scene begins benignly with flowering bushes in 'real time'. 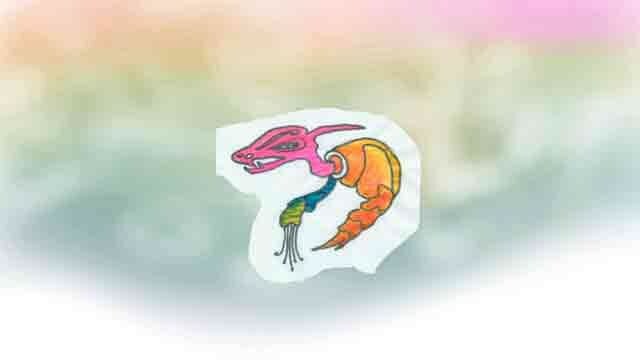 The ominous buzz of insects cuts across the soundscape. 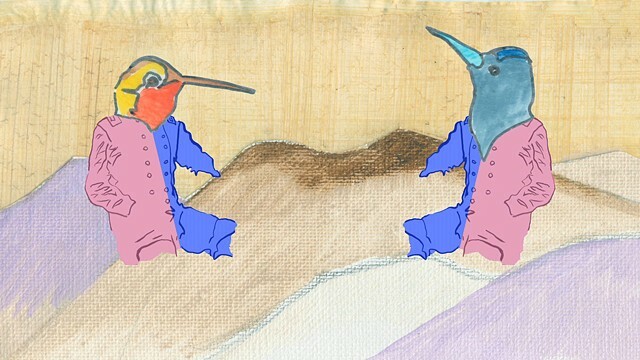 The narrator's rich baritone voice (Winston Tong) delivers the poem with dreamy, wicked glee that reverbs in sync with bird song....and we are thrown into another dimension. In a collage employing crude cutouts, primordial insect-like forms float across the panorama of vague mounds and shifting patterns of sky. The headless soldiers’ jackets lovingly sprout flowers and bird heads towards one another while this parade of otherworldly beings moves disjointedly across the scene. A stripping off of façades, to notational scrawls and arrow indications by Falconer, creates a humorously terrifying atmosphere where love has no real place, no face, but exists on the animator’s dreamscape battlefield. A lilting composition, 'Le Petit Jardin' (Lee Maddeford) plays on. As with Genet's portrayal of prison life, beauty holds on despite horror; even as innocence can exist in times of atrocity. 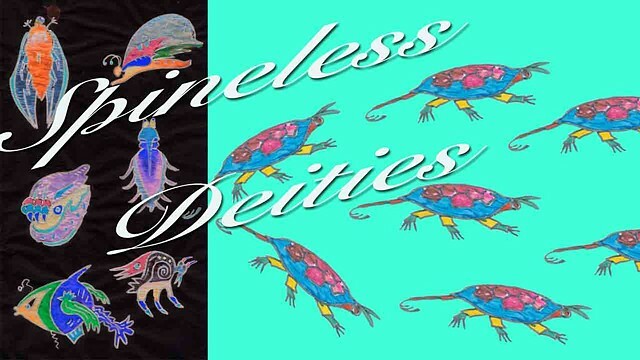 'Spineless Deities' is a tribute to this paradox and an honoring of the memory of fallen Queer comrades. 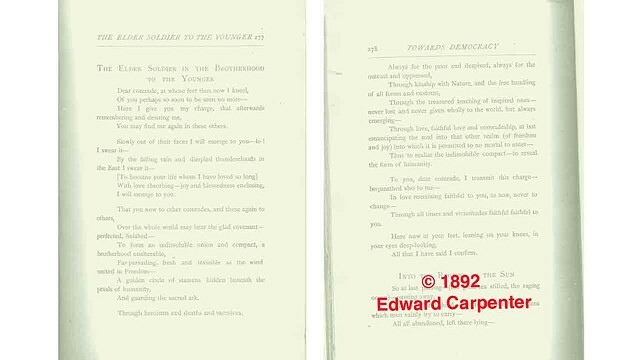 In this folder, a graphic still and the complete text of Carpenter's poem as it appears in TOWARDS DEMOCRACY (1892).